While most people think of love when they think of Paris, the city actually has some pretty spooky sites. Read on to learn 10 haunted places to visit in Paris. Visiting Paris, you might be thinking of things like romance or history. But with Halloween soon approaching, this is also a great time to think about visiting the haunted places of Paris. Paris is one of the world’s most historic cities. In the Middle Ages, it was a major cultural hub, but the city was well-established long before that. With so many centuries of history, there’s been plenty of time for some of Paris’s historical sites to become haunted. If you’re planning a visit to Paris, add some excitement by being sure to visit some of these spooky places. Ready to learn about the dark, thrilling side of France’s most famous city? Keep reading before you plan your trip! The Catacombs should top any list of haunted places in Paris. This mass grave is unlike anything you’ll find elsewhere in the world! More than six million people’s remains are in this underground network of tunnels. The burial part of the Catacombs is actually only a small part of a massive network of underground tunnels that spans the whole city. No one has explored most of these tunnels for decades, if not centuries, making what could have been done there even more frightening. For centuries, people mined the ground beneath modern-day Paris for limestone. In the late 18th century, when the city’s cemeteries began to overflow, Parisian officials decided to use part of these ancient mines as a mass grave. They transported dead bodies from the existing cemeteries overnight in covered wagons. For some decades, this underground burial site was forgotten. But in the early 19th century, people started using it as a novelty site for parties and events. Gradually, it turned into the major tourist attraction that it is today. However, their popularity doesn’t make the Catacombs any less spooky. 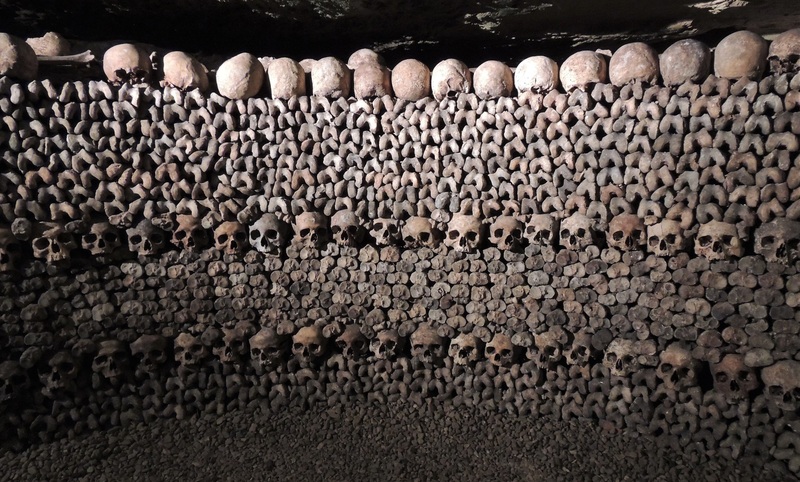 To see it for yourself, book a Paris Catacombs Tour on your visit to haunted Paris. Just one look at the outside of this historic cathedral will have you convinced that it’s haunted. Built over a span of centuries from the 1100’s to the 1300’s, this is one of the earliest examples of Gothic architecture and one of Paris’s oldest monuments. Many visitors to the cathedral over the years have told stories of ghost sightings. With the ancient statues and gargoyles hovering along its walls, you can easily see why the cathedral has a spooky ambiance. The spirits of ancient monks, kings, and more may still walk inside its walls. If you want haunted sights, the logical place to is a cemetery, and Paris’s largest cemetery does not disappoint. Famous musicians from Frederic Chopin to Jim Morrison are buried here, in case you’re looking for famous ghosts. Unlike the majority of Parisian cemeteries, which are organized in neat rows, much of P?re Lachaise is an elaborate maze of paths. As you walk through, you’ll find yourself surrounded by statues and tombs. For a more straightforward fright-fest, visit this haunted museum-like show. It’s a walk-through haunted house, but it’s not like any you’ve ever seen before. Professional actors will bring Paris’s darkest historical moments to light with an interactive exhibit that will spike your adrenaline. A city as old as Paris has no shortage of haunted cemeteries. This one also contains the graves of famous figures, such as Alexandre Dumas. But, what makes this cemetery really spooky is its history. It was a mass grave during the French Revolution, so countless restless souls found their end here. If you see the name Fragonard in Paris, you might be looking at a perfume brand. But, the Fragonard family is well-known for more than making scents. A veterinarian named Jean-Honor? Fragonard, a relative of the family, made his name as a cadaver preservation expert. Head to the Mus?e Fragonard to see his collection, which includes everything from individual organs to entire bodies. It’s actually one of France’s oldest museums. He meant for his work to be educational, but there’s no doubt that it’s a little bit frightening as well. This royal palace is 21 km southwest of Paris, but it’s worth the trip if you’re looking for haunted places. This is an attraction for many different reasons, not only because it’s haunted. You’ll be amazed by the magnitude of the gardens and the architecture. But, famous ghosts like Marie Antoinette are, allegedly, roaming the grounds, too. Along with the ghost sightings, a few people have reported finding a loophole in time at the palace. If you stumble upon an 18th-century party, don’t panic; you’re not the first one that’s happened to! It stands to reason that a fortress used as a prison should be among the most haunted places in Paris. Marquis de Sade was one of its famous prisoners. But other more mysterious figures whose true identities have never gotten discovered, like the Man in the Iron Mask, are also buried here. A lot of suffering happened in this fortress until it came down during the Revolution. This leaves little doubt that some souls have stayed behind to haunt it. Ready to See the Haunted Places of Paris? Finding haunted places in Paris is as easy as taking a stroll through the city. In a place so historic, there’s an ancient building or a creepy story around almost every corner. But, to see the most famous haunted places on this list, you’ll definitely want to plan ahead and buy tickets so you can avoid the lines. Looking for more places to visit this October? Don’t miss my guide to autumn vacation destinations here.